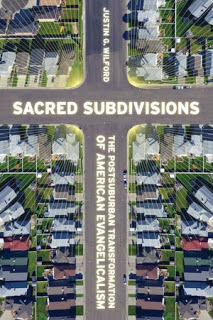 I am pleased to announce that Religious Studies Review has published the second of my reviews of Justin Wilford’s wonderful 2012 book on Orange County’s Saddleback Church, Sacred Subdivisions: The Postsuburban Transformation of American Evangelicalism (New York University Press). Over the last year, I was asked by three journals to write reviews of this book. The first was published last September 2013 in the AAG Review of Books. This piece in Religious Studies Review is the second one. The third will be part of a review forum on the book in Social and Cultural Geography and will focus on the usefulness of Wilford’s text for the Asian American evangelical activism that took place in September and October 2013. [Note: while I initially wrote a draft of that third review before the activism took place, I substantially rewrote it afterwards in order to observe how useful Wilford’s study was in the interplay of academia and activism.] The editors of the various journals understand that I have placed reviews that explore different angles of Wilford’s book, and in the spirit of transparency, I have sent copies of the different reviews to Religious Studies Review, the AAG Review of Books, and Tristan Sturm (who is organizing the SCG forum) to guard against self-plagiarism. This present review in Religious Studies Review presents Wilford’s book to a religious studies audience. It is a very short review–what Religious Studies Review calls more of a ‘note’–that observes that Wilford has made a substantial geographical contribution to the social scientific study of religion. While geographers have often not been part of the broader conversation in the social science of religion, this book begins a conversation that I hope will continue to make inroads into a conversation of which we should be an integral part. In particular, I observe that Wilford’s ingenious examination of Saddleback’s usage of secular space for theological purposes subverts the religious studies obsession with defining ‘religion’ and calls religious studies scholars to closer analyses of how theologies are grounded in space. For those who are wondering still if they should get this book, my answer in this review is a definitive yes. Following my thoughts in the review, I have discovered that Wilford’s text is an excellent starting place to talk about current work in geographies of religion. When I am asked at conferences about geographies of religion (i.e. where my work on Cantonese Protestant and younger-generation Asian American and Asian Canadian engagements with publics fits in the discipline), I often refer my interlocutors to the New York University Press book stands to pick up this book. As it was recently observed at an ‘Author Meets the Critics’ session for Sacred Subdivisions at the Association of American Geographers, books like Wilford’s remind geographers that publishing monographs would be helpful to advancing human geography as a discipline in interdisciplinary conversations. I am happy to endorse this text as a fruitful beginning point for such engagements, and I look forward to the conversations that it will generate both within and without geography. I’ll likely be unable to make this conference, but I thought this was an excellent example of how geographies of religion are integral to current trends in social and cultural geography. If you are interested, please apply following the instructions at the end of the call for papers. Human beings are grieving animals and, moreover, animals that cannot let death have the last word. Anthropologist Douglas Davies (1997) famously suggested the simile of ‘words against death’ to address the manifold ways in which human beings respond to bereavement (words, music, rituals, architecture) and express their ‘trust in hope over fear’. With the ‘spatial turn’ in the humanities and the social sciences at large, and the growing interest in human geography for the works of mourning, the phenomena of bereavement and memorialization have increasingly been analysed through a ‘spatial lens’ (see e.g. Maddrell & Sidaway 2010) and from the perspective of material culture (see e.g. Hockey et al. 2010). The present session wants to carry the discussion further by focusing on consolation, a phenomenon which stayed on the background of earlier discussions. This altered focus is compounded in the session’s title. There have seen excellent analyses of ‘deathscapes’ (Hartig & Dunn 1998; Kong 1999; Maddrell & Sidaway 2010), what we want to achieve in this session is an analysis of ‘consolation-scapes’. How is space/place involved in consolation? How can material culture approaches inform analyses of consolation? Where do we stand today, consolation-wise, and how have we got here? How does our contemporary outlook differ from the outlook of times past, and how does all this relate to the spatial dimension of consolation? The present session calls for contributions from a wide range of disciplines: geography, history, theology, philosophy, sociology, and anthropology. Christoph Jedan (c.jedan@rug.nl), Associate Professor of Ethics, Department Christianity, Philosophy and Culture, Faculty of Theology and Religious Studies, University of Groningen. Currently working on the history and continuing relevance of argumentative consolation across theology and philosophy. Together with Eric Venbrux (see below), he is founder of the thematic group Death and Consolation in the Netherlands School for Advanced Studies in Religion. Most recent monograph: Stoic virtues: Chrysippus and the religious character of Stoic ethics, London/New York 2009. Eric Venbrux (e.venbrux@ftr.ru.nl), Professor of Anthropology of Religion, at Radboud University Nijmegen. He is director of its Centre for Thanatology. Eric Venbrux has researched widely on ritual change, in particular the transformation of rituals surrounding death in the Netherlands. Among his numerous publications is also the co-edited volume Rituele creativiteit: Actuele veranderingen in de uitvaart- en rouwcultuur in Nederland [Ritual creativity: Recent transformations in the burial and bereavement culture in the Netherlands], Zoetermeer 2008.